Here is a gorgeous little mushroom with a very ugly name. 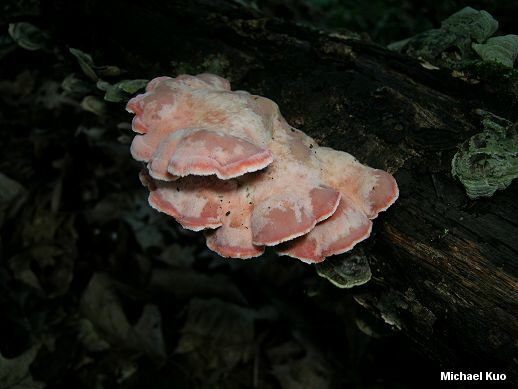 "Phlebia incarnata" sounds like the flapping, flustered daughter who was never let out of the house--and the previous name for this mushroom, Merulius incarnatus, wasn't much better. 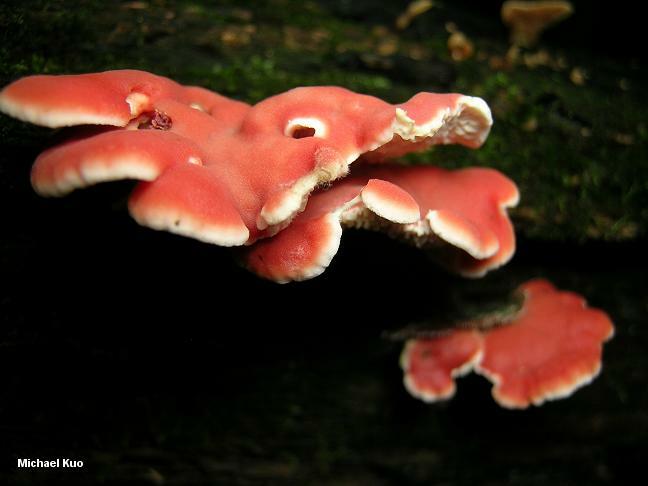 At any rate, it is found on hardwood logs from the Mississippi watershed (where it is apparently most common) eastward. When fresh the overlapping caps are coral pink, and unmistakable. The white undersurface lacks true pores, but it often becomes so wrinkled and veined that it gives the illusion of being poroid (for this reason I have treated it as both a polypore and a crust fungus). 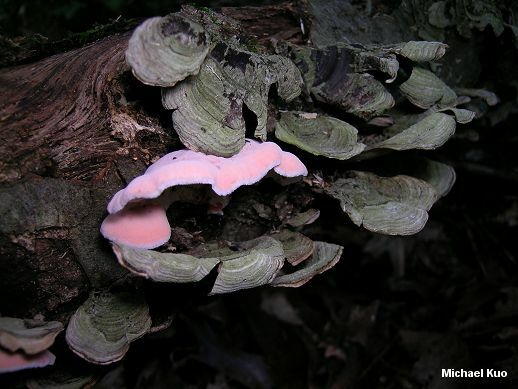 In my experience Phlebia incarnata is almost always found growing alongside (or even intertwined with) Stereum ostrea. 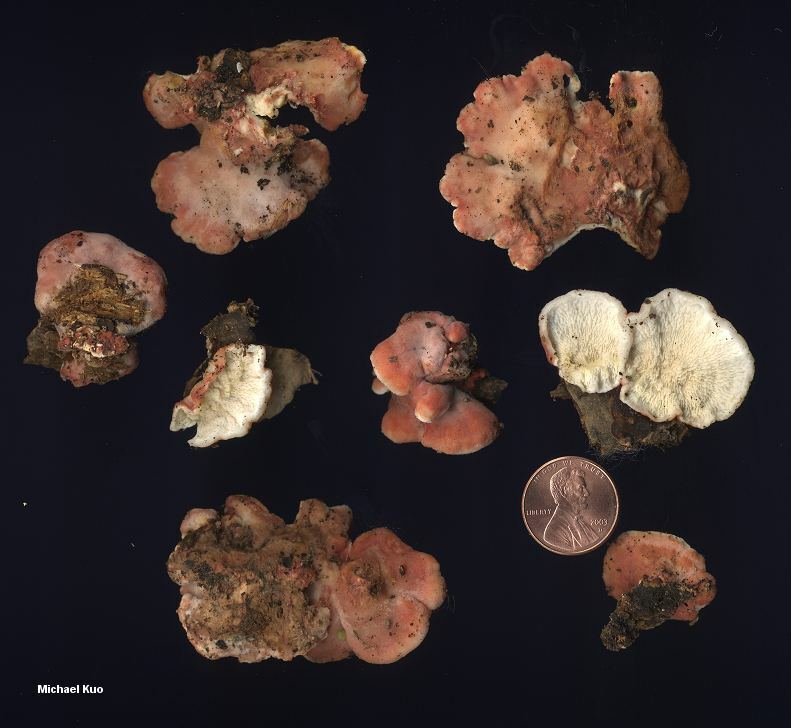 Though I'm unaware of any officially documented relationship between these fungi, many collectors and mycologists have also noted this apparent association. 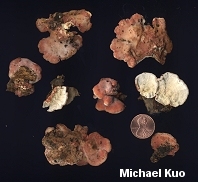 Ecology: Saprobic; growing in overlapping clusters on hardwood logs and stumps, particularly those of white oak, beech, maple, and birch; causing a white rot; annual; possibly associated with Stereum ostrea (see above); late spring, summer and fall (and over winter along the Gulf Coast); fairly widely distributed east of the Great Plains, and in Texas and Mexico. 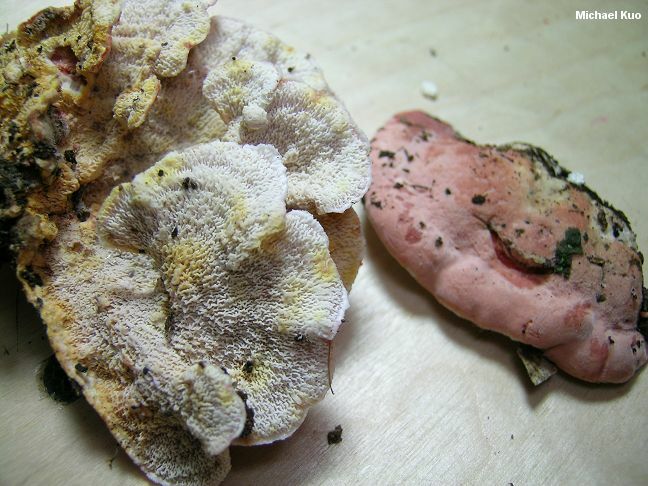 Cap: 1.5-7 cm across; more or less semicircular, irregularly bracket-shaped, or kidney-shaped; flattened-convex; smooth or finely hairy; bright coral pink, fading with age; the margin wavy, often white. Undersurface: Whitish to pinkish, becoming dirty white or tan; bald, but wrinkled, folded, or almost toothed near the point of attachment; bruising mustard yellow on mature specimens. Flesh: White; soft at first, but soon fairly tough and leathery. Chemical Reactions: Cap surface and flesh yellowish green to olive yellow, then pale orange, with KOH. Microscopic Features: Spores 4-6 x 2-2.5 µ; smooth; elliptical; inamyloid. Cystidia, hyphidia, pseudoacanthohyphidia and acanthohyphidia absent. Clamp connections present. REFERENCES: (Schweinitz, 1822) Nakasone & Burdsall, 1984. (Saccardo, 1888; Ginns, 1976; Lincoff, 1992; Metzler & Metzler, 1992; Barron, 1999; Miller & Miller, 2006; Binion et al., 2008.) Herb. Kuo 05280404. Merulius incarnatus is a synonym.